When it comes to our shared apartment, I will say that I take up a majority of the space – whether it's my ridiculous amount of things or my endless heaps of home decor. I really wanted Dillon to have something that was only his, so when I found this beautiful DIY Copper Hat Rack tutorial on Pinterest, I knew I wanted to make something similar for him. I am not very artistic when it comes to DIY-ing, but this project was one that truly anyone could do. This DIY was not only easy to assemble, but it cost me under $10 to make, which is a win in itself! Dillon uses the rack to showcase his favorite hats easily within reach. 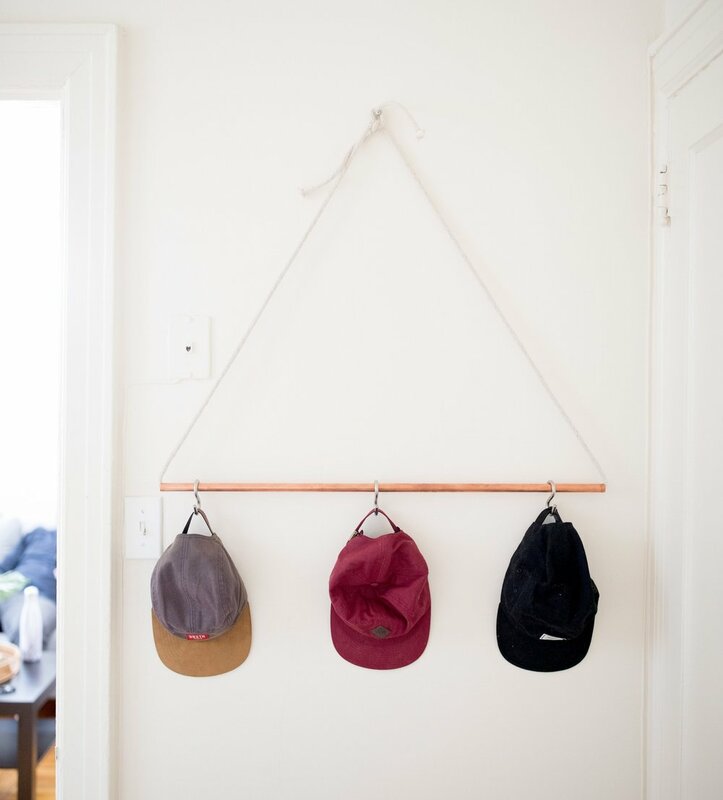 The S hooks make it really easy to keep the rack looking organized and functional, and you can keep adding more hooks as you get more hats! Copper Pipe – I went to Home Depot for my supplies, and the Sales Associate had a spare copper pipe cut down from a customer early in the day, so I wound up paying nothing for the pipe! It is worth it to ask if they have any spare pieces so you can skip the price of the pipe, which could get costly. I used a 3/4-inch copper pipe and it's about 31.5 inches long (a little over 2 1/2 feet). Depending on the space you are working with, you can make the length longer or shorter. S Hooks – I got 3, but you can definitely get more if you have a larger pipe. I made sure to test that the S hooks fit the diameter of the copper pipe before I left the store – that is super important or you will be running back for an exchange. White Rope – You can really use any type of rope, but I really liked how minimalist and clean this simple white one looked. Regardless of the kind of rope you get, make sure the diameter of the rope will fit the opening of the copper pipe. I bought about 8 feet of rope so I could make sure I had enough for the amount of height I wanted and for tying a large knot at the top for hanging. Nails – You really need only one nail and that's for securing the rope onto the wall. Was this helpful for you? What other kind of DIY's would you like me to post? Let me know in the comments!